If you're a person who loves to shop, there's a chance you'll come across an item or two that's sitting practically new inside your closet. And if the novelty and/or thrill of the idea of owning such an item already left you, you can always put your unwanted fashion up for sale. 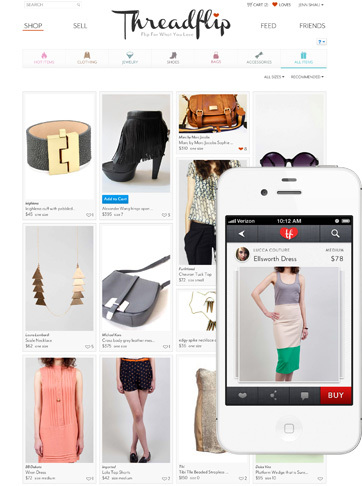 San Francisco startup Threadflip is out to give users a novel way of discovering, buying and selling fashion. Users of the site upload images of items - clothing, bags, shoes, jewelry - they wish to sell and set their own price tags. Photos can be imported from Instagram and Facebook. One feature the site offers is convenient shipping. The moment your item lands itself a buyer, Threadflip sends you a prepaid box, shipping label, even wrapping material. And if you're hands are too full to allow you time to do the selling yourself, Threadflip also offers a "white glove service" where all you do is send your items t o the company, and Threadflip's stylists do the photo uploading and pricing research for you. A 15% cut goes to Threadflip for regular sales, whereas it charges 40% of the purchase price for its white glove service. Threadflip aims to build a tight and solid community of social shopping enthusiasts.